What are your dog’s favorite hobbies? I’m sure you can think of many things he likes to do, right? wrong? does he just like to watch DOGTV all day? oh well, that’s ok too. Today we will find out once and for all what are the top 5 dog hobbies. Ready? Today’s very special guest writer is Richard Rowlands. Richard is a writer for the pet industry, and a keen pet enthusiast. He works with pet businesses to improve their marketing and increase profits. To find out more, please visit his website. The results are in! We’ve traveled up and down the country in our quest to interview over 1000 dogs about their favorite hobbies. Well, not really. But we’ve had a good look at what our canine companions love doing most and have arrived at our DogTV Top 5 Dog Hobbies! Come rain or shine, most dogs just love going for a walk with their human. So why is walking a top dog hobby? Because walks are FUN! There’s a whole wide world out there full of smells to sniff, people to meet, and places to explore. Most dog owners know this all too well. Just mention the word “walk” in a muffled whisper and your dog races for the door. If you really want a spectacle, just take out the leash and your dog’s running rings around the house, ready and raring to go! Dogs have an appetite that knows no bounds. Breakfast, lunch or dinner. It don’t matter! Your dog is always ready to chow down. Bones, biscuits, treats, table scraps. It’s all on the menu as far as your dog’s concerned. Life’s a buffet, and they’re ready to eat all they can. Dogs are active and social creatures who just love to play. Chasing balls, sticks or frisbees, wrestling you for their favorite toy, or a good old-fashioned game of hide-and-go-seek. These are all great ways to enjoy some fun playtime with your dog. 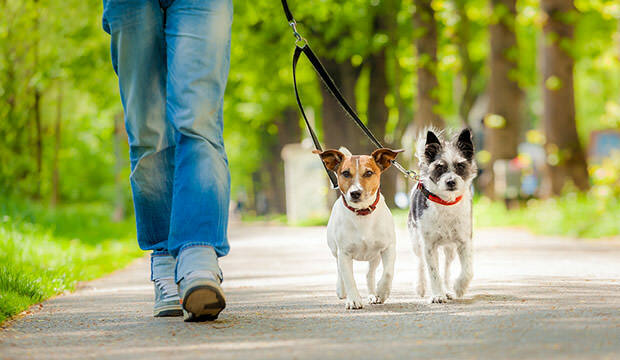 Just like walking all over town with your furry friend, games are a great way for humans to get some healthy exercise. Taking forty winks, napping, having a little lie down – whatever you want to call it, dogs love to sleep. And with all the activity they get up to during the day, is it any wonder? Dogs sleep on average 12-14 hours a day. Time well spent curled up in a cozy ball recharging their batteries for the next big adventure. Yep, that’s right. We had to include this on our list of the top 5 hobbies for dogs. But it’s true. Dogs love to watch TV (especially DOGTV!) Why? Because dogs react to the visual and auditory stimulation the television provides. It turns out that dogs don’t like silence, It makes them anxious – especially if they’re at home by themselves. Watching the right kind of TV show can put your dog at ease, or even stimulate and energize them while you’re out of the house. So there you have it. Our DogTV Top 5 Dog Hobbies. Let us know about your dog’s favorite hobby by leaving a comment below!